Televisions, PCs, monitors, appliances and more... 1-855-F'IN-JUNK can haul it all away in a single pickup. Recycling Your E-Waste Doesn't Have to be a Hassle! With the rapid advancement of technology, most of us have at least a few obsolete electronic junk items that we'd like to get rid of. The problem is that many electronic devices contain toxic materials that can leech into the ground and water over time if they're left to sit in a landfill. So generally, electronics do not belong in the trash. In fact, it's illegal in most areas to toss certain items (such as CRT televisions) into the dumpster. 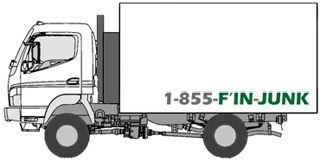 1-855-F'IN-JUNK can pick up any e-waste you've got at your home or business. Whether it's an old computer, big screen TV, or large junk appliance, we'll pick it up wherever it's sitting - no need to carry it out the door or down the stairs. How much does e-waste removal cost? Are there extra disposal fees? No, most electronic junk items are covered by our regular volume prices and do not carry additional disposal fees. If you know the approximate size of the electronic waste that you need hauled, you can make a ballpark estimate by checking our junk removal price chart. How do I schedule pickup for my electronic junk? Scheduling is easy, and only takes a minute! Just give 1-855-F'IN-JUNK a call during business hours at 1-855-346-5865, or contact us online anytime.